There’s always a moment when your breath seems to escape in the mountains surrounding Lake Tahoe. Maybe it’s when you’re riding a ridge of the Tahoe Rim Trail. Perhaps you’ll experience it during a game of disc golf, or at the end of a sunrise hike to Emerald Bay; you’ll look up and gasp at the beauty of the Sierra Nevada mountains. Sure as the vanilla smell of Jeffrey pines sweetens the air, Tahoe was made for mountain human-powered sports. Ponderosa pines frame wayward trails that seem to disappear around copses of aspen. Alpine lakes dot the landscape and vaulting mountain peaks invite both beginner and novice adventurers. There’s a little something for everyone in these mountains — mountain and road biking, hiking, golf, even aerial silks. From deep in the mountains to right along the water’s edge, North Lake Tahoe is filled to the brim with human-powered sports options. Here’s how to experience them like a North Tahoe local. Spanning 165 miles in length, and surpassing 10,000 feet in elevation at its highest point, you could say there’s a lot of the Tahoe Rim Trail to explore. Most choose to take on segments of the Rim Trail as a series of 14 day hikes. Then there are some who opt to make the trial into a backpacking adventure. Make sure to check all rules and regulations for camping on the Rim Trail if you plan on taking a multi-day trek. The Tahoe Rim Trail is also one of the premier mountain bike destinations in the West. Intermediate to advanced mountain bikers will find stunning lake views, challenging singletrack and heart-pumping ascents and descents across North Tahoe’s segments of the Tahoe Rim Trail. Note that the sections of the Tahoe Rim Trail that coincide with the Pacific Crest Trail and enter wilderness areas are off limits to mountain bikers (including the Mt. Rose Wilderness and Barker Pass to Echo Lakes). Because of heavy usage, mountain bikers are allowed on the Tahoe Meadows to Tunnel Creek section of the trail near Mt. Rose Summit only on even-numbered calendar days. If you find yourself in Tahoe sans a proper mountain bike, head over to Northstar California. It houses the Specialized Bike Academy, which offers small group mountain bike lessons. You can also check out one of the many bike shops around North Shore. Mountain bikers headed out for Tahoe Rim Trail rise should double check that they have all the right gear, including extra tire tubes, helmet, food and water. Help preserve Tahoe’s beauty by staying on marked trails, and be sure to bring plenty of sunscreen and water on the trail. If the Tahoe Rim Trail is not your speed, there are miles and miles of other trails to be found in the North Tahoe region. Check out more hiking options here, and biking trails here. There’s no better way to cap off a long summer hike or a challenging mountain bike ride than with a little food and an ice cold drink along the shore of Lake Tahoe. The North Tahoe Ale Trail is your guide to that after-ride refreshment. The Ale Trail is a collective map of all the sweet spots for Tahoe brews and great food. While reaching them all in one day may be a tall order, marking off every spot by the end of the summer is a pretty satisfying accomplishment. Many areas hugging the North Tahoe shoreline are extremely accessible by bike. Here is a map of bike routes along the Ale Trail. Most stops are pretty far apart, so you can plan for a prized beer waiting at the finish line. For an easy ride off the Ale Trail, start at Squaw Valley and ride along the bike path following the Truckee River toward Dollar Point. 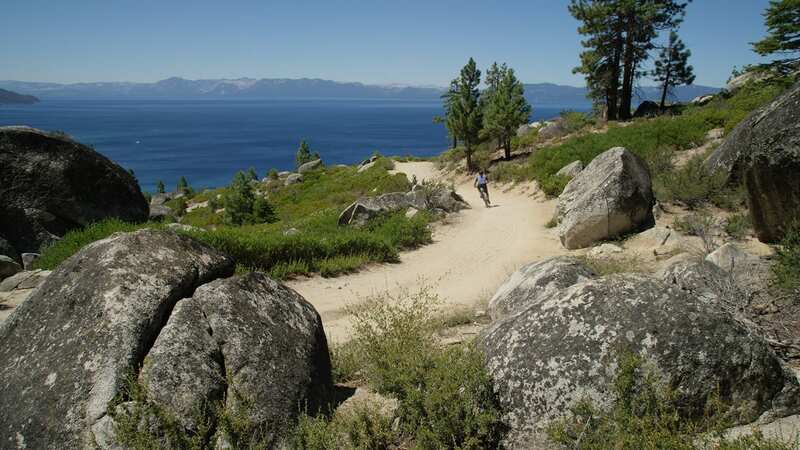 A slight climb hugs the North Lake Tahoe shoreline for fantastic views of the lake on a relaxing 10-mile ride. Use proper hand signals and follow the rules of the road at all time. Use bike lanes when possible, and be aware of pedestrians. Research your route ahead of time, and prepare for parts of Tahoe with narrow road shoulders. A variety of charity races are held around the North Shore year round. If you’re interested in participating, follow North Lake Tahoe on social media to keep up with events. Whoever said human-powered sports in North Lake Tahoe had to be limited to the traditional? If you’re looking to venture beyond hiking and biking, North Lake Tahoe delivers the fun and unique. Test your aim at Tahoe Vista Regional Disc Golf Course, where an easy beginners course awaits new disc golfers. At just over one mile with 18 holes, it’s a prime location to practice skills or engage in fierce competition. Similar to traditional golf, “fore!” is a welcomed courtesy to alert anyone nearby of an impending disc throw. Activities at Tahoe Vista Regional Park aren’t just limited to disc golf — a new treetop adventure course made up of 70 tree platforms is ample entertainment for families, groups and couples. Or try another view of the world from above at Tahoe Flow Arts Studio where instructors teach the elegant practice of aerial silks to students, showing them the movements they are capable of while suspended in air only by a piece of fabric. Tahoe Vista Regional Park is also a haven for dogs. Leased canines are welcome in all areas of the park, and there’s even an unleashed dog park. 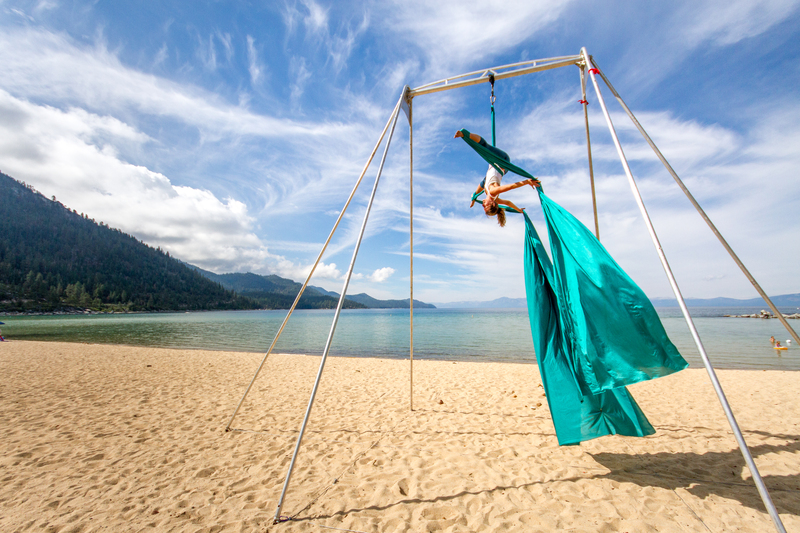 If silks aren’t your calling, Tahoe Flow Arts Studio also offers yoga, flow and dance instruction. Visit GoTahoeNorth or more information on all of the human-powered sports possibilities in North Tahoe. The post From Disc Golf to Dangling from Aerial Silks, North Tahoe Serves up Summer Adventures for Everyone appeared first on Go Tahoe North.